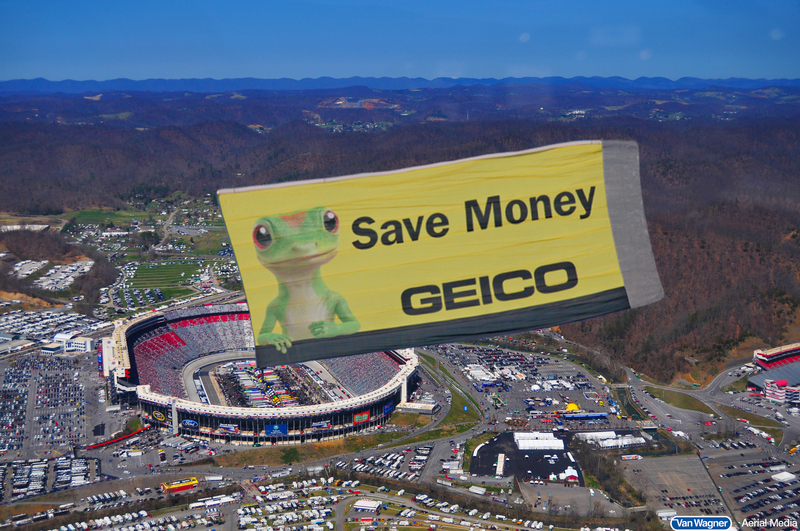 Why Choose Plane And Blimp Advertising At NASCAR Races? How much does a NASCAR sponsorship cost? There are many different types of sponsorship opportunities at NASCAR series events. To have a series named after your brand, such as the Sprint Cup, it will cost you in the millions. To sponsor a single race, you will pay somewhere between $350,000 and $500,000. If you’re looking to add your logo to the car, this primetime placement will cost you anywhere between $1.5 million and $200,000. Of course, in the world of NASCAR, pretty much everything is negotiable. Are these numbers a little too high for your marketing budget? This is where we can help. NASCAR fans arrive at the racetrack up to 5 days before the actual race. They take this time to tailgate, talk shop, and meet other NASCAR fans. This is the perfect opportunity to fly your brand’s messaging over the racetrack and capture the attention of a vast, captive audience. Not only will your aerial sign receive thousands of impressions, it will also help cement your brand awareness. NASCAR fans are a loyal bunch; by associating your brand’s messaging with the event you will gain allegiance from a vast demographic of fans. Why put a tiny logo on the side of a car, when you could fly a larger-than-life aerial banner above the track? Looking for an even bigger way to make an impact? Try blimp advertising. By using a blimp as your advertising vehicle, you can incorporate television broadcasting and reach the millions of consumers viewing from the comfort of their homes. Furthermore, your advertising dollars won’t be limited to just one race; you can fly over the biggest sporting events of the year for a fraction of the cost. Whether you’re looking to target men, women, families, or sports fans, aerial advertising can target your campaign’s key demographic. Make sure to check out some of the best aerial advertisements from Van Wagner’s Aerial Advertising Hall of Fame. Let us help you plan your next aerial advertising campaign. We have over four decades of outdoor advertising experience and are the industry leaders in aerial advertising. If you have any questions, please don’t hesitate to contact us today, or click below for a free quote.